How does solar panel size factor into the total size of your solar array? Solar panel size is an important consideration when designing your solar installation. The size of your panels can affect the number of panels you can fit on your roof and therefore how much energy your roof-top installation can produce. There are different ways to look at a solar panel’s size. In the most basic sense, you can look at its physical dimensions – its width and height. Or, you could look at the number of solar cells that panels are composed of. Most of the time however, when we discuss the size of a solar panel, we are referring to the panel’s wattage, also known as the panel’s capacity or output. For residential panels, wattage is the only measurement that truly varies from one panel to the next – dimensions and cell count are fairly constant across the board. That’s not to say that only a panel’s wattage is important. All three of these measurements of solar panel size affects an installation. Let’s dig in to each of these measurements of solar panel size and see how they affect solar installations. As mentioned, solar panels are composed of solar cells. Each solar cell measures roughly 5” wide by 5” tall. 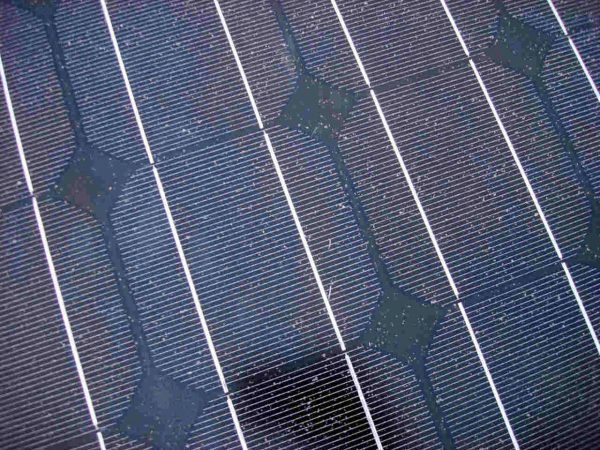 Residential polycrystalline solar panels (the most commonly installed solar panel for homes) are typically composed of 60 solar cells – 10 rows of 6 cells each. If you look closely, you can actually see each solar cell and count the number of cells in a panel! When you add in the solar panel’s aluminum frame and space between the cells, we get a panel that’s about 65” tall by 39” wide (or roughly 5’x3’). Commercial solar panels are typically composed of 72 solar cells and are about 3’ x 6’. Commercial solar is usually installed on large, flat roofs or large open land adjacent to a building where space isn’t as much of an issue as a compact residential roof. As you can probably surmise, the number of solar cells in a panel affects a solar installation’s production, as more solar cells means more electricity can be produced. To increase the number of solar cells in an installation, simply add more panels. Solar panels’ large physical dimensions can also affect installations. First, a homeowner must have enough space on their roof to install enough panels to cover an adequate amount of their energy requirements. The average solar installation in the US is 5.6 kW – about 20 panels – and many large national installers have a minimum number of panels homeowners must install, usually around 8 panels. So if you have a very small or cramped roof, the sheer size of the solar panels could be an issue. Secondly, because the dimensions of solar panels are quite large, installers have a hard time completely covering irregularly shaped roofs. Out of necessity, there will be areas where panels simply can’t be placed. This is one of the most frequent obstacles homeowners meet while going solar – their roof size or dimensions limit the number of solar panels they can install. However, by careful planning and assessment of all placement options on the roof, installers and homeowners can usually figure out how to use the maximum amount of roof space available. The number of solar cells in a solar panel, along with the efficiency of those cells, determines a solar panel’s wattage. Wattage is simply how much electricity, measured in watts, a panel can produce under perfect situations in any single instance. Average residential solar cells are about 17 to 18% efficient (meaning 18% of the sunlight that hits the panel is converted to energy) and, as mentioned before, produce about 4.5 watts of electricity. With 60 cells in a single panel, this adds up to about 265 watts per panel when panel inefficiencies are taken into account. Solar cells used in cheaper ‘value priced’ solar panels typically see lower efficiency (around 15%) and therefore produce around 240 watts per panel. When comparing standard efficiency panels to value-priced panels, 20 to 25 watts doesn’t seem like a huge amount, but it quickly adds up when you’re installing 30 to 40 panels on your roof! Keep in mind that lower wattage isn’t necessarily a bad thing, it simply means you’ll need more solar panels to generate the same amount of electricity as higher efficiency panels would. So if you have plenty of roof space, installing lower wattage panels could be a smart financial decision, as they are typically cheaper. To really bring this point home, let’s look at an example. Let’s pretend you live in cloudy, but beautiful Portland, OR. You want to install a solar installation that will produce 7200 kilowatt-hours (kWh), enough to cover 100% of your energy use. Using the National Renewable Energy Lab’s PVWatts solar calculator, we find that to produce 7200 kWh a year in Portland, OR, you need to install a 6.3 kW system. (For context around kilowatts vs kilowatt-hours, remember that a 9 watt LED lightbulb uses 9 watt-hours of electricity if left on for one hour. If left on 24 hours a day for an entire year, it would use almost 79 kWh). Using our article What are the Best Solar Panels, let’s compare the highest and lowest wattage panels on our list to see how many panels you would need to install to meet your goal of a 6.3 kW system. These budget priced polycrystalline panels are only about 14% efficient, but have a very low price point. As you can see, we’d need almost 30 panels to make a 6.3 kW system. Many national installers use Hanwha as a cost-effective and efficient option. Because of Hanwha’s greater efficiency only 24 panels are needed, a full 3 panels less than Topoint! That’s a lot of roof space saved! 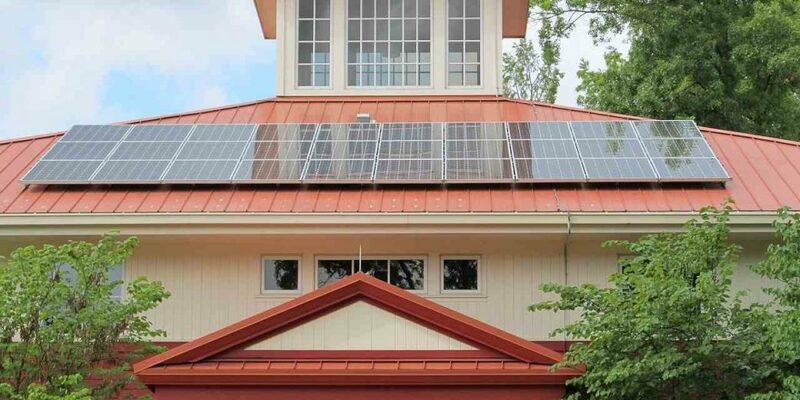 The most efficient residential solar panel on the market. While Sunpower’s panel is monocrystalline (not polycrystalline like most residential solar panels installed), they are ultra-efficient. You’d need only 19 panels to make up a 6.3 kW system – about 1/3 as many panels as with Topoint! With this uber-efficiency though comes cost – and you’re going to pay quite a bit more for this premium product! As you can see, the wattage of the panels greatly affects the number of solar panels needed. Choosing which panels to install is really a balance between the limitations of your roof and cost. If you have a very constricted small roof where space is at a premium, a higher efficiency solar panel will allow you to install less panels and still keep your energy production as high as possible. On the flip-side, bountiful roof space allows you to install a larger system with cheaper lower-efficiency panels, potentially saving money. Either way, there is a solar panel out there to suit your needs!